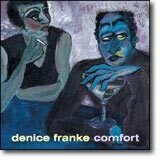 Denice Franke has a rich, deep voice full of color and nuance. She sings of personal relationships and possibilities, and the downside of those connections when they fail. She hails from Texas where she has worked with the likes of Nanci Griffith, and has been lauded by Lyle Lovett. It's easy to see why. Her songs are so well crafted, and her lyrics are so knowing and true, that it's only a matter of time before the powers that be have her signing on the dotted line. I call it kindred skin. The recording closes with the delightful, celebratory "Dance to the Moon." [mp3 from www.denicefranke.com] It's a tribute to life, to love, and to the wonder of the natural world.